For manufacturers throughout California and across the country, the new year brings new challenges—and a wealth of new opportunities. But to take advantage of these opportunities, manufacturers of all sizes need to be aware of emerging trends—and willing to adapt to them. From the widespread acceptance of digital technologies to the alignment of information technology (IT) and operational technology (OT), it’s safe to say the times they are a-changin’. So without further ado, here’s a preview of the top 5 manufacturing trends of 2018. If you haven’t fully embraced e-commerce, you’re not reaching your full potential. Business-to-business (B2B) and business-to-consumer (B2C) internet businesses have evolved from basic communications channels to complete end-to-end mediums, with consumers estimated to spend $632 billion online by 2020. If you haven’t already made the move to online transactions, resolve to make 2018 the year you do. It’s time to get smart. The use of real-time data and intelligent technology is changing the manufacturing game, while enhancing communication, productivity and technology. From Software-as-a-Service (SaaS) to the Internet of Things (IoT)—a trend IBM expects to become massive in 2018—the need to implement SM processes cannot be stressed enough. Robotic technologies have been on factory floors for decades, but today their impact is reaching into logistics and supply chain organizations. And, unlike their predecessors, they’ve become much more intelligent and agile. While costs have historically kept many small and mid-size manufacturers (SMMs) out of the robotics game, it’s becoming increasingly important for them to adapt and adopt as these technologies take center stage. Cyber espionage may sound like something out of a James Bond movie, but today’s manufacturers are finding themselves increasingly under attack by hackers and malware. In fact, the FBI’s Internet Crime Report revealed that the financial loss from cyber crimes exceeded $1.3 billion in 2016 alone. There are a variety of steps you can take to protect your business, beginning with an IT audit and penetration test. Otherwise known as 3D printing, this industry disruptor has rapidly evolved and matured. From aerospace to automotive, healthcare to consumer packaged goods (CPG), manufacturers in a variety of industries are now creating customized three-dimensional parts from digital designs, giving them a significant competitive advantage. 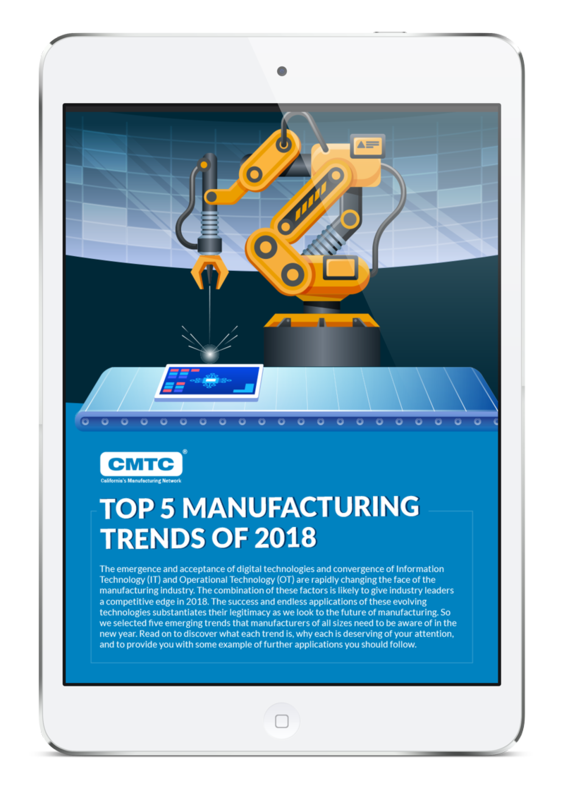 Dive deeper into 2018’s top manufacturing trends by downloading our free guide. Explore the technologies, the tools and trends you’ll need to be on top this year and to remain successful in the future.